Rare Find! 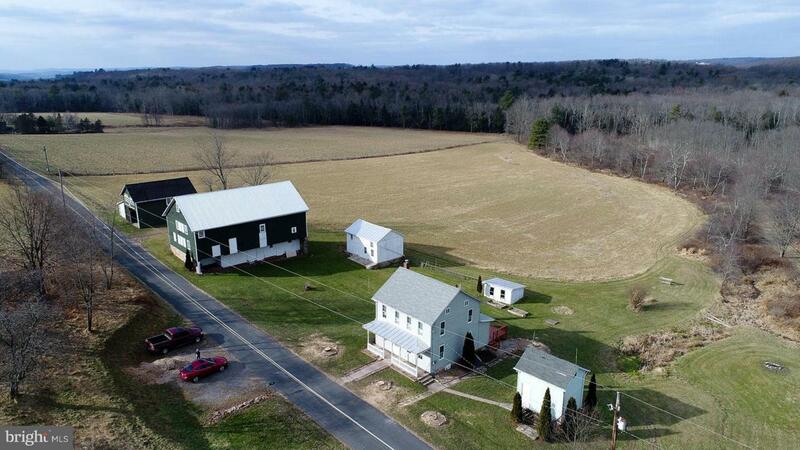 10.3 Acre Farmette w/ Beautifully Remodeled Farmhouse, Spacious 2 Story Garage, Large Post & Beam Bank Barn, Spring House/Summer Kitchen plus additional out Bldgs. Acreage in Clean & Green. Peaceful country setting nestled on the N side of the Blue Mountain with plenty of elbow room! The 1st floor of the farmhouse hosts spacious living room, remodeled kitchen, full bath w/laundry and an extra room that can be your office or an additional bedroom. 2 Floor is home to 3 bed rooms & full bath with walk up to 3 floor attic. Home has all new windows, carpets, paint & more. The 19th century Majestic Post & Beam Bank Barn will wow you as you step inside! Add to all of this the additional Summer Kitchen/Spring House, room for gardens, large animals, maybe even chickens etc. You'll find yourself removed from the hustle & bustle of the modern world yet within a 10 min drive to state roads for easy access to Allentown, Reading, Hazleton & Harrisburg. Short drive to Blue Mountain Ski area, Arts & Entertainment plus Fine Dining. Call now!